This card cannot be Normal Summoned or Set. This card cannot be Special Summoned except if there are 10 or more monsters in your Graveyard. Once per turn, you can Special Summon 1 Level 8 or higher Angel-Type monster from your hand or Graveyard. Its effect(s) is negated, and its ATK becomes 4000. Esta carta nao pode ser Normal Summoned ou Set. Esta carta não pode ser Special Summoned Exceto se existem 10 ou mais monstros no seu Cemiterio.Uma vez por turno,você pode Special Summon 1 Monstro Nivel 8 ou maior Angel-Type da sua Mão ou Cemiterio.Seu efeito é negado e seu ATK se torna 4000. Shooting quasar dragon---> efeito no anime( penso que seja quase igual ao real). During each Battle Phase, this card's maximum number of attacks is equal to the number of Synchro Material Monsters used to Synchro Summon it. When this card attacks, you can negate battle destruction negation effects, until the end of the Battle Phase. If this card attacks an opponent's monster, you can negate the effects of the attack target, until the end of the Battle Phase. You take no effect damage. This card is unaffected by the effects of your opponent's monsters. 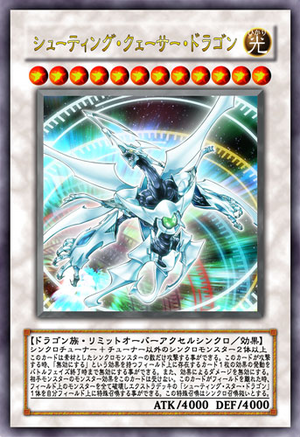 When this card is removed from the field, destroy all monsters on the field, then Special Summon 1 "Shooting Star Dragon" from your Extra Deck. (This Special Summon is treated as a Synchro Summon.) That monster's effects are negated.